A great way to for tax planning would to legally defer the income into the future, accelerating your deductions, as well as paying your taxes before the due date. Every taxpayer enjoys receiving a tax refund. In fact, most will enjoy this more that they would any other form of a refund. Without a doubt, any form of refund feels great, but none can match the feeling of a tax refund. However, this does not mean that you have to pay more than what is required of you for the joy of getting the refund. A great way to for tax planning would to legally defer the income into the future, accelerating your deductions, as well as paying your taxes before the due date. It is not advisable to prepay your taxes. The best option would be for you to come up with an estate tax payment, which should be something close to what you owe the tax agency. However, there are instances where prepaying is a great but not a mandatory idea. Unfortunately, trying to predict how much you owe can be quite a nightmare. On the other hand, the effort will prove worthwhile since the government never pays any interests. By prepaying your taxes several months before time the due date, you will simply be losing money. If you prepay an year ahead, you stand to lose more money. An electronic payment is much faster than paper checks. According to IRS, once you file a paper return, your refund should not take more than six weeks. On the other hand, if you file your returns electronically, he refund should be made within three weeks. You can also go for the direct deposit opting to receive your refund if the returns were not filed electronically. This may also apply where the tax agency has trouble while sending you a paper check. Once you receive the paper check, keep it safe, and do not lose it. Replacing a check can be quite a hassle and you do not want to find yourself in such a predicament. Most taxpayers are usually fall for the notion that once they receive the refund, the returns has been audited and successfully approved. This is wrong thinking. 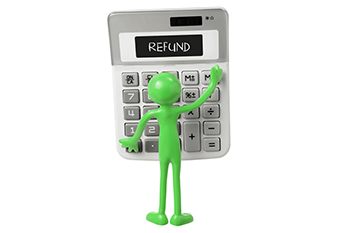 In fact, the fact that you have received your refund does not necessarily mean returns have been audited or approved. On the contrary, it takes up to 3 years for returns to be audited.